This listing is for a box of two adapters. If you need a set of 4, select a quantity of 2. Click here to order custom wheel adapters! IMPORTANT: You may need to purchase short hex lug bolts for adapters 1" or smaller. You can add these to your order using the above dropdown. 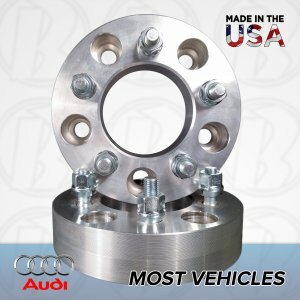 Our high quality billet wheel adapters are made from 6061-T6 T6 grade Billet aluminum for superior strength and hardness. Our adapters are carefully manufactured by a dedicated team of professionals in our facility in San Bernardino, California. All of our products are rigorously inspected and carefully packed before shipment ensuring unsurpassed quality and satisfaction from our customers. We build custom adapters, and are happy to help you find the exact product for your needs. NOTE: Please double check you are ordering the correct item before you place your order. Tire Shop Supplies will ship the item listed, and cannot be held responsible if you order the wrong part. Please contact us to verify fitment if unsure.